GEORGIA -- For eight days straight, Linda Underwood caught cats in traps outside her home and called animal control to get the felines who had overrun her Oak Grove Circle neighborhood. On Wednesday, animal control officers caught 41 more, many of which were kittens, inside the house across the street. The house, which also contained two dogs, had ammonia levels at toxic levels and was declared a health hazard by the health department. "Twelve months ago, I had four cats. It got way out of control," homeowner Stephen Ragnar Ramstadius said as he loaded belongings into his truck in the rain. "I want to apologize to my neighbors because I'm sure it hasn't been pleasant." Ramstadius asked police officers, who obtained a search warrant Tuesday, to take possession of his animals, said Cpl. Darren Moloney spokesman for the Gwinnett County Police Department. Ramstadius, who Moloney said is about 45, has been served with 43 animal neglect citations, misdemeanors which carry maximum penalties of $1,000 fine and 30 days in jail for each count, according to the police. Moloney said investigators believed more cats were inside the residence, when officials left the scene after noon Wednesday. Non-lethal humane traps were set inside the home and will be checked daily, he said. All of the animals were taken for treatment. "The ultimate goal will be to rehabilitate all of the animals so that they will be fit for adoption," Moloney wrote in e-mails. "It will be a while before anyone will be able to adopt these animals. They are all going to a vet for a thorough examination. These things take time." Underwood, who lives across the street from Ramstadius, sat on her porch with neighbors to watch as HazMat, fire, animal control, health and police officials searched the house and trapped animals Wednesday. With a trap in her front yard, Underwood said neighbors have tried to protect property for months. One neighbor even put an electric fence around her garden to keep the cats out. "They use my flower bed as a litter box. They sleep on my lawn furniture, tear up my wicker," Underwood said, adding that she's allergic to cats. "It's just been cat after cat after cat." While they weren't happy about the publicity for the community, neighbors said they were glad to see the authorities at the house Wednesday. The smell, they said, had already improved. "It's something to be concerned about," Quay Taylor said of the toxic fumes in the house. She said Ramstadius had lived in the neighborhood more than 10 years ago and had been married until about six years ago. While she and Underwood said they did not know him well, they said they believed he worked on computers from home. But on Wednesday, Ramstadius was forced to leave. According to Moloney, officials will meet with the homeowner today to discuss steps that have to be taken before the house can be habitable again. Vernon Goins, spokesman for the Gwinnett Health Department, said he expected some extreme measures to be required, including removing the flooring, sheetrock and ceiling. "The feces and insects, fleas and such, we are concerned about carrying disease," Goins said. "This is the third time we've required something that extreme in the county, to strip it down to the two-by-fours." Goins said there were dead animals inside the house, although Moloney could not confirm that. "It's always sad to find someone in that situation because they are trying to do good but it's misdirected," Goins said. "I'm afraid it's gotten more and more common." 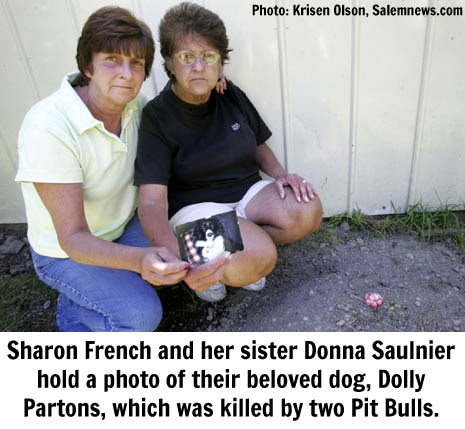 MASSACHUSETTS -- Sharon French is still mourning the loss of her beloved dog, but she's convinced the pit bulls that attacked it Tuesday afternoon really had their sights set on something far more precious. "They were coming for the kids," she said. In an interview on the deck where her dog, Dolly Parton, was killed, French yesterday vividly described the attack that could result in the pit bulls being put down, a decision their owner says he would fight. French and neighbors say the dogs frequently roam free, contradicting the claims of their caretaker, who said their attack Tuesday happened only because they escaped from their cages when he tried to give them water. French and her sister, Donna Saulnier, share a home on Safford Street in Ipswich. Tuesdays are play dates for French's granddaughter Samantha, 8, and Saulnier's granddaughter Briana, 6. The two girls spent the morning in the yard, tossing a Frisbee, swinging on the swing set and playing games. At just before 1 p.m., Saulnier was shocked to see two pit bulls tearing across the street toward her. "I screamed, 'Get the kids in the house ... pit bulls,'" Saulnier recalled yesterday. 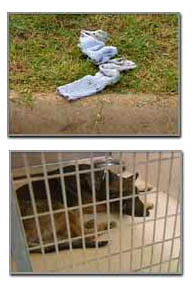 The two women herded the girls to safety, and Saulnier scooped up the family's 12-year-old Welsh corgi-cocker spaniel mix. The dog had been sound asleep and was leashed to the deck. Saulnier was trying to get the leash off when one of the pit bulls leapt up and tore the little dog from her arms, drove it to the deck and ripped its throat out. "She was killed instantly," French said. "She never knew what hit her." The other pit bull had the corgi by its hind legs, and the two were trying to rip the dog in half, French said. "That's something you never, ever want to see," Saulnier said. Both of the girls witnessed the attack from inside the house. French tried to intercede and grabbed a club to beat the attacking dog, but what happened then frightened her into inaction. "He (the pit bull) looked up at me, his face was covered in blood, and he bared his teeth at me and growled," French said. "I was too scared to hit him." As traumatizing as the attack was, the sisters agree it could have been worse. They're convinced the pit bulls did not initially target Dolly. She hadn't been barking and in fact had been sleeping for more than an hour. "There's no way they could see her from over there," French said. "No one will ever convince me they weren't coming to rip those kids apart," and Dolly was just unlucky enough to be out on the deck. "They wanted to kill something." After killing Dolly, the pit bull picked her up in his mouth and carried her back across the street. He stood over the dead animal, blood dripping from his face, daring anyone to take the dog from him, French said. Ipswich Animal Control Officer Matt Antczak arrived at the scene and immediately called for police backup, fearing the dogs might have to be shot. However, he was able to use a long pole with a noose on the end of it to finally wrestle both dogs into his truck. "They don't pay him enough money," French said. The pit bulls, Sonny B, 7 years old, and Nemesis, 8 months, are owned by Michael Stelline Jr. of Beverly. He gave the dogs to his former employer, Bob Carroll, on Tuesday so he could attend his great-grandmother's funeral. He blamed Carroll yesterday for the entire incident. Carroll said Wednesday the dogs bolted from a kennel when he opened the door to give them water. But Stelline said Carroll was explicitly told not to let the dogs out of their crates under any circumstance and had actually opened the door to let them out to be chained to a run. "He should have listened to what I told him," Stelline, 18, said. "None of this would have happened." Stelline said neither of his dogs had ever been involved in an attack before. According to witnesses, Carroll had actually allowed the dogs to run free all day. Butch Taves, who owns an auto repair shop in the same building as Carroll, told police Tuesday he had seen the dogs several times that morning. Amber Hammett, who works in a company located above Carroll's The Trailer Connection, said she saw the dogs roaming, as well. What's more, Hammett said Stelline had the dogs over several times in the past week and a half, and she never saw them on a leash. Stelline denied the dogs were ever at Carroll's shop without a leash, but Hammett said she became very concerned about the free-ranging dogs because she has a 4-year-old she sometimes brings to work. A former pit bull owner herself, she has strong opinions about the breed. "They're very aggressive, dangerous dogs," Hammett said. "They have to be leashed at all times." Carroll claims that he chased after the dogs as soon as they escaped, but Hammett said he was working inside his shop and didn't even know what was going on until someone ran in and told him. Saulnier and French also contradicted Carroll's claim he was right behind the dogs. While the attack was underway, Saulnier ran into the street to try to get Carroll's attention. "I screamed, 'Bob! Your dogs are killing my sister's dog!' at least five times," Saulnier said. "He was not right behind those two pit bulls," French said. Carroll said yesterday he thought one of the dogs ran behind his shop after escaping, and he followed in that direction before being called to the scene of the attack. "I did everything I could to help that dog," Carroll said. The pit bulls will remain caged and in Antczak's custody until he determines their fate. He could order the dogs euthanized, and if he does, Stelline said he'll appeal the decision. Asked if he had any concern the dogs might stage another attack someday, Stelline was adamant. "No. They're under my control whenever they're with me and when I leave them, they're in their cages." He repeated that as far as he is concerned, Carroll has sole responsibility for the tragedy. French and Saulnier plan to insist the dogs be put down. "These two dogs are no good," French said. A hearing before the town's selectmen is tentatively scheduled July 23. Dolly was buried behind a shed in her backyard under a small pile of dirt, a flower | now wilting | placed atop it by Saulnier's granddaughter. Both little girls are still shaken. French said her granddaughter, Samantha, is afraid to come back to visit and, when she does, doesn't want to go outside. "She told her dad she had a dream that the bad killer dog was coming to kill her just like he killed Dolly," French said. Stelline could be charged with violating a town bylaw that punishes owners whose dogs kill either a deer or a domestic animal. There is a $100 fine for the offense. Carroll has already been charged with violating the town's leash law and will have to pay a $50 fine. That's hardly punishment enough for French. "He should be charged with child endangerment," she said. There was some consolation for French yesterday. Most Tuesdays, she babysits her 10-month-old granddaughter. She would have been in a bassinet at the foot of the steps on the deck, French said. "We could never have gotten to her in time." 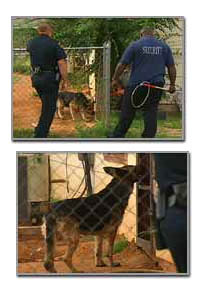 TEXAS -- A Lubbock woman is in surgery after being attacked by a German Shepherd Monday morning. That dog is now in the custody of Lubbock's Animal Control. Lubbock's Animal Control responded to a number of animal bites over the weekend, including two serious ones. Now two male German Shepherds remain in the custody of Lubbock's Animal Control for the same reason, attacking and causing significant harm to their victims. "This is the first time I've heard of him really biting anybody," says neighbor Yolanda Ingold. A German Shepherd allegedly attacked 31-year-old Beth Cory as she was going to her mailbox at 73rd and Hickory. An ambulance took her to UMC with bites on both her legs as well as one to her right shoulder, bites that now require surgery. Neighbors claim the dog has been violent in the past. "The girl that he attacked, it was her dog that he killed," says Ingold. Cory's family members say the German Shepherd killed Cory's Boston Terrier just three months ago. And for the most recent attack, Kevin Overstreet, Director of Lubbock's Animal Control, says the dog's owners will receive a citation. "Pet owners are responsible for making sure their property is secured and that animals aren't able to get out and if for some reason they do we have to hold them accountable," says Overstreet. And a new law will do just that beginning September 1st. Pet owners could face third degree felony charges and face two to ten years in prison if their animal viciously attacks a person. But those charges probably wouldn't apply to another attack in Lubbock this weekend; in that case, a different German Shepherd attacked a postal carrier attempting to deliver mail in the 1900 Block of 73rd Street. "A small child had opened the door and at that time the dog exited the residence and attacked the postal worker," says Overstreet. The postal carrier was taken by ambulance to Covenant where he received 100 stitches to the face. "We really feel like the animal was protecting its property," says Overstreet. In either case the city wants to remind pet owners of the rules. "We do have a leash law in the City of Lubbock and that's covered by our city ordinance. It's so important for people to be mindful, especially if they have an aggressive animal, to make sure they are not able to get outside the fence or home and if they do have them outside to have a leash on the animal," says Overstreet. Violating the pet leash ordinance could result in a fine of up to $200. Overstreet tells NewsChannel 11 Animal Control has responded to 237 animal bite incidents since January first of this year. Beth Cory, the woman who was attacked Monday morning, remains at UMC Monday evening. The postal carrier who was attacked on Saturday has since been released from Covenant and is recovering at home this evening.